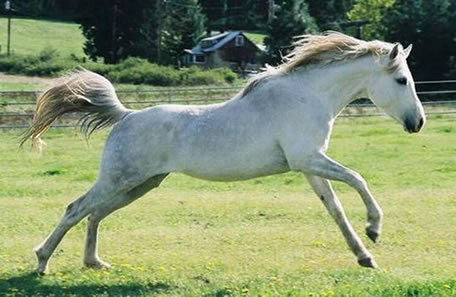 Timer is a grey Arabian race bred stallion with excellent race pedigree credentials and a hard luck racing history. After showing much track promise he was injured and although he became completely sound was unable to live up to his race bred pedigree. History favored his half sister, K Tiki Sprite, with the honor of being Cal Bred Race Horse of the Year for 2007 and 2008 with LTE of $50,100. Racing career aside, Timer still carries the blood of champions line bred into his pedigree. With lines to the immortal Arabian racer, Kontiki, on both his sire and dam side; Timer has excellent bone, racing conformation and a regal appearance. A pretty head is complements of the Egyptian Arabian line to El Hilal in his pedigree as Kontiki bred horses are not necessarily known for typy looks. His temperament is set to please and his intelligent eyes constantly appraise his surroundings. He is a ranch favorite with the ranch kids who camp outside his corral to pass the time of day with him. Timer is an excellent choice for racing offspring, sport horse prospects or as the perfect cross on quarter horse mares for typy foals who can grow up to do it all! K Tiki Thyme, was a race horse in her own right. Bred and raced by Krisean Performance Horses, she was twice Race Horse of the Year in OR, cleaned up on the CA Fair circuit and retired completely sound after years of racing with LTE of . 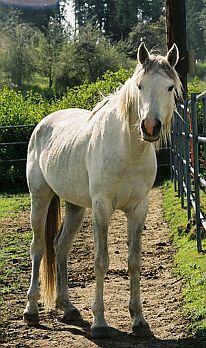 She is the dam of Whistler by Sam Tiki, LTE who went on to an endurance career. Also the dam of K Tiki Sprite, Cal Bred Race Horse of the Year for 2007 and 2008 with LTE of $50,100. Tiki Thyme’s sire was the immortal Flaming Streak+/ a multiple track record holder, a holder of 2 world records 5/34(12-7-7)4 stakes, and also a sire of other stakes winners. 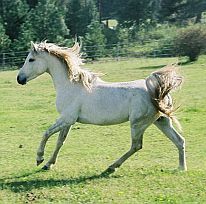 El Tiki, raced for 6 years in 66 races and retired sound to be a sire. A testament to the sound bone and good competitive mind found in the Kontiki bred horse line. He was a track record holder at 11/6 miles.